We like to walk around cemeteries, especially in the fall. You may think I’m being morbid, but the greater Boston area has two beautiful garden cemeteries that are more like parks than burying grounds. 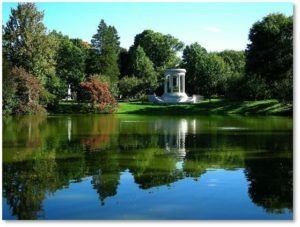 Mount Auburn Cemetery in Cambridge and Forest Hills Cemetery in Jamaica Plain deserve visits for many reasons. I acquired my interest in cemeteries early on as I grew up across the street from one. 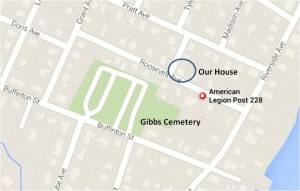 Gibbs Cemetery in Somerset, MA, occupies an odd location in the middle of a block. Houses separate it from the street along the north and west sides and it is open only to Buffinton Street on the south. As kids, we played there, especially on a new extension that (at the time) had few graves and a stretch of grass with a huge puddingstone glacial erratic in the middle. We got into the cemetery by stepping over a crumbled stone wall that separated it from the American Legion Post on Roosevelt Avenue, another auxiliary playground. In both places, we played hide and seek, tag, free-the-box, statues, and a lot of other games. I learned to ride a two-wheel bike on the cemetery’s gravel roads. 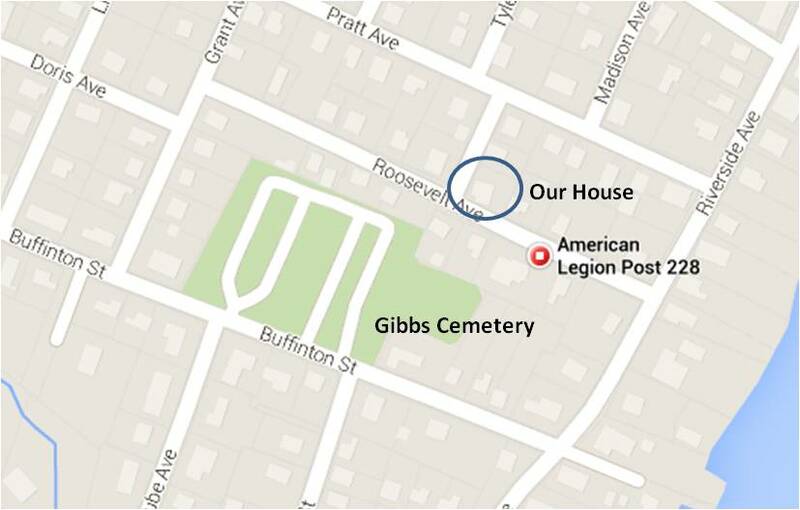 When I felt claustrophobic with six people in our three-bedroom, one-bath house, I retreated to Gibbs Cemetery, taking a book and an apple for some quiet reading. The residents never bothered me but I sometimes got odd looks from living people. In June, my friend Pauline and I would raid rose bushes and bring flowers over to put on the multiple small stones that showed what an epidemic of smallpox, diphtheria, measles, scarlet fever or some other disease children don’t get anymore had done to a family. With my sister, Diane, we would cross the cemetery to get our friend, Liz, who lived on the other side. If it got dark while we were playing there, we would race across the cemetery, past the gravestones and leap the stone wall to safety in our bright homes. Thus, it does not strike me as odd to walk around garden cemeteries that are beautifully landscaped with roads, paths, lakes, fountains, hills, dells, and even a tower. One walks through an outdoor museum that combines botanical garden, arboretum, wildlife habitat, and sculpture museum. Forest Hills, founded in 1848, spreads across 275 acres. Mount Auburn has 170 acres and was founded in 1831. If the only cemeteries you have ever seen are flat, suburban burying grounds gridded with straight roads and studded with ordinary gravestones of the same height and shape, you have no idea how beautiful these Victorian garden cemeteries are. People — lots of them — come to Mount Auburn and Forest Hills for exercise and to breathe fresh air, to watch birds and other wildlife, to view the flowers and trees, to exchange city streets for gorgeous scenery, and to appreciate the beautiful gravestones, monuments, and memorials. Many of these mark the resting places of famous people. More than a few were created by America’s finest sculptors. You can use a map to find the graves of authors, historians, artists, architects, athletes, chefs, religious figures, entertainers, entrepreneurs, and philanthropists. Or you can just wander along and be surprised. Sometimes you wonder, “Is that person related to. . .? “ or “Is that actually the famous person I’ve heard of. . . ?” Keep your smartphone handy and do your research on the spot. Mount Auburn and Forest Lawn both give tours. Some are general explorations while others focus on specific topics such as specimen trees, historical figures, famous authors or notable monuments. Forest Hills has a walking tour of Boston’s Benefactors on October 1 at 2:00 p.m.with local historian Anthony Sammarco. Mount Auburn offers a fall foliage tour on October 21 at 1:00 p.m. I have taken a couple of these tours and they are very interesting. You’ll find a list or calendar of tours offered by the garden cemeteries on their web sites. We usually visit at least one interesting cemetery in the fall. 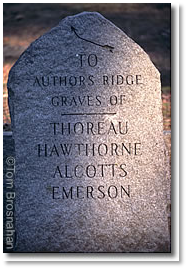 Besides Mount Auburn and Forest Hills, we have explored Sleepy Hollow Cemetery in Concord with its famous Author’s Ridge, the burial place of many famous 19th-century writers and Transcendentalists. I have a “bucket list” of places to visit. (Ironic considering the origin of the phrase.) At the top of that list is Hope Cemetery in Barre VT, where granite carvers did some of their best—and most unusual work. I would also like to walk around Grove Street Cemetery in New Haven CT, and visit St. Louis Cemetery in New Orleans LA, “home” of Voudoun priestess Marie Laveau. I lived in Brooklyn NY for nearly four years but it never occurred to me to visit Washington Cemetery there because I didn’t realize how interesting it was until I saw it in a movie recently. Maybe I’ll add that to the list. 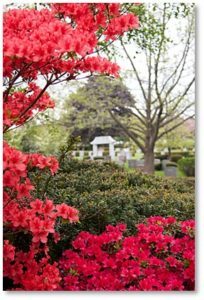 If you would like to try a new place to walk and explore, consider garden cemeteries. I think you’ll be surprised. along with the two Sphinxes. This entry was posted in Art and Museums, Boston, History and tagged Bird Girl, Bonaventure Cemetery, Daniel Chester French, Forest Hills Cemetery, Gibbs Cemetery, Mount Auburn Cemetery, Sleepy Hollow Cemetery, Somerset by Aline Kaplan. Bookmark the permalink.